All transactions are safe and secure with a reliable history in online purchasing behind each of our associates. Buy the Boardwalk Empire: The Birth, High Times, and Corruption of Atlantic City to own Boardwalk Empire clothing and merchandise. Uncover the real story behind your favorite HBO TV show, Boardwalk Empire. 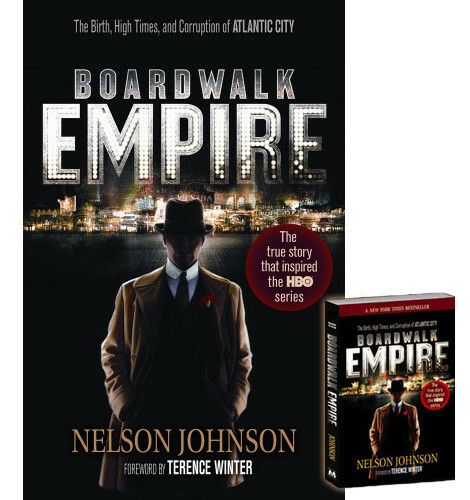 Nelson Johnson's book not only sheds light on the man behind the show's central character, Nucky Thompson, it also provides an exploration into Atlantic City's shady past from the Prohibition era to its modern day revival. Perhaps most impressive (and frightening) is learning about the extent of political corruption and organized crime that existed in the city during the 1920s and beyond. In addition to the Boardwalk Empire: The Birth, High Times, and Corruption of Atlantic City above, browse the Boardwalk Empire Clothing Gallery for more apparel like men's and women's clothes, kids shirts or hoodies.